1- Hearing, discussing and approving the Board of Director’s Report on the Company’s activities and its financial position for the financial year ended 31st December 2018 and the Company’s future plan. 2- Hearing and approving the External Auditor’s Report for the financial year ended 31st December 2018. 3- Discussing and approving the Company’s Balance Sheet, Profit & Loss accounts for the financial year ended 31st December 2018. 4- Approving the Board of Director’s proposal to distribute cash dividends to the shareholders for the financial year 2018 at the rate of (10%) of the nominal value of the share (equivalent to QR (1) One Qatari Riyal per share). 5- Discharging the Chairman and members of the Board from liability for the financial year ended 31st December 2018 and determining their remuneration. 6- Appointing the Company’s External Auditors for the financial year 2019 and approving their fees. 7- Discussing and adopting the Company’s Corporate Governance Report for the year 2018. 8- To review and adopt the Nomination and Election Regulations for the Board membership. To approve amending the Company’s Articles of Association, to align with the Governance Code for Companies and Legal Entities Listed on the Main Market issued by QFMA’s Board pursuant to Decision No. (5) for the year 2016*. To Authorize the Chairman of the Board of Directors or Vice Chairman to solely sign all required documents necessary to amend the Company’s Articles of Associations. Shareholders entitled to attend the meeting are the shareholders listed as per Qatar Central Securities Depository Registrar upon the closure of trading in Qatar Stock Exchange at the same day of the General Assembly Meetings. The published invitation announcement in local newspapers, Qatar Stock Exchange website and the Company’s website shall be deemed as the official legal announcement to all shareholders, with no need to send special invitations by courier as per the terms of the Commercial Companies Law no. (11) Of year (2015). 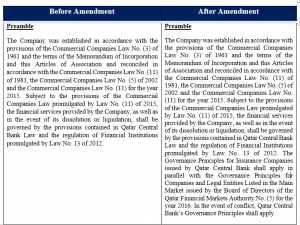 For the Shareholders viewing, a list including all information stipulated in Article (122) of Commercial Companies law no. (11) Of year (2015) with respect to the in-kind and monetary benefits obtained by the Chairman and members of the Board of Directors, their remunerations, in addition to all the other statements required pursuant to this Article, shall be available at the Secretariat of the Board of Directors located at the Company’s Headquarter, one week before the convention of the Annual General Assembly. For the Shareholders viewing, a list including all the statements stipulated in Article (26) of the Governance Code for Companies and Legal Entities Listed on the Main Market, related to the Company’s concluded transactions with the related parties, shall be available at the Secretariat of the Board of Directors located at the Company’s Headquarter, one week before the convention of the Annual General Assembly. Shareholders are requested to bring their ID cards and proxies (or Delegation letters in case of Companies’ Representatives) one hour before the starting time of the meeting, to ensure timely registration. Should the shareholder be not able to attend in person, he may authorize another Company Shareholder to attend, via a proxy (which can be found at the Company’s premises at Al-Asmakh Street), after evidencing his capacity as a Shareholder. It is not permissible to grant a proxy to a non-shareholder in the Company, or a member of the Board of Directors. The number of the shares held by the attorney in this capacity shall not exceed (5%) of the capital of the Company. Should the delegating shareholder be a natural person residing outside the state of Qatar, the proxy is to be ratified by the Qatari Embassy in that country. Should the shareholder be a legal Corporate Entity (Company, Authority, Organization), a written, signed and stamped proxy by the shareholder is required, attached with an updated copy of the Company’s Commercial Registration. Should the delegating shareholder be a Company established outside the state of Qatar, the proxy is to be executed by the Company’s representative, ratified by the Qatari Embassy in that country and attached with a copy of the Commercial Registration of the Company, also ratified by the Qatari Embassy in that country. – The Approval of the Financial Statements and Dividends distribution is subject to Qatar Central Bank’s approval and other related Regulating Authorities. 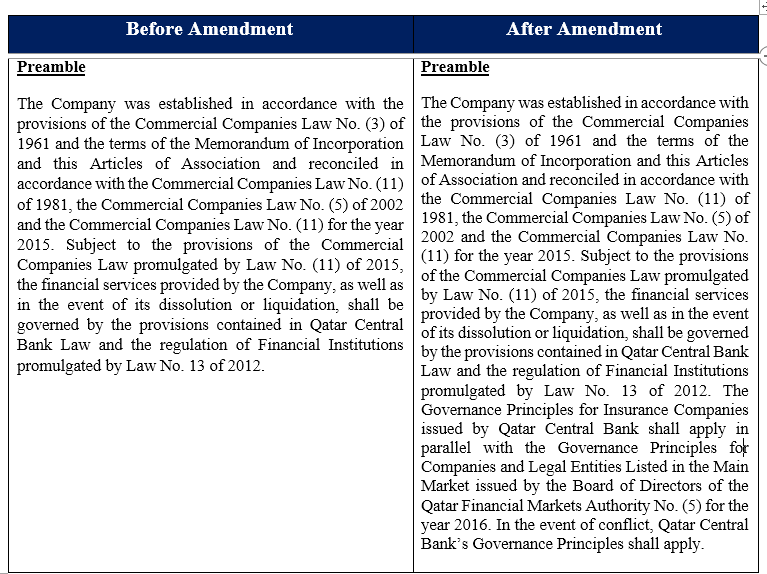 *For further information relating to the Proposed Amendments at the Company’s Articles of Association, please refer to the Company’s website (www.qgirco.com) in Arabic language.